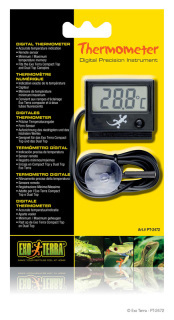 The Exo Terra Digital Thermometer is equipped with a remote sensor for accurate measurement and durability. This precision instrument comes with a programmable minimum and maximum memory setting which can be controlled with one single button. The Exo Terra Digital Thermometer's sensor is held in place with a suction cup, while the instrument can be mounted in three ways - with Velcro (included), with a screw, or it simply slides into place on an Exo Terra Compact Top or Dual Top. Maintaining the proper temperature and humidity levels in a terrarium is vital for the well being and health of all reptiles and amphibians. 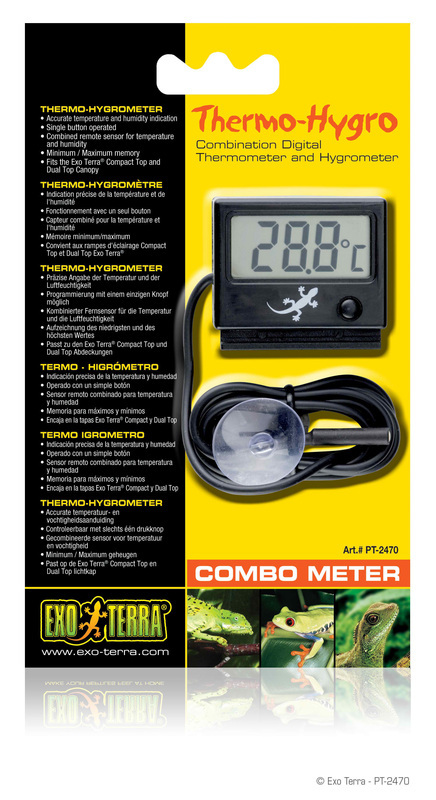 The Exo Terra Digital Hygrometer is equipped with a remote sensor for accurate measurement of air humidity and durability. This precision instrument comes with a programmable minimum and maximum memory setting which can be controlled with one single button. The sensor is held in place with a suction cup, while the instrument can be mounted in three ways - with Velcro (included), with a screw, or it simply slides into place on an Exo Terra Compact Top or Dual Top. Maintaining the proper temperature and humidity levels in a terrarium is vital for the well being and health of all reptiles and amphibians. Features include a 6 foot remote sensor probe, a dual port plug receptacle to control multiple heating devices, and adhesive pads for mounting. 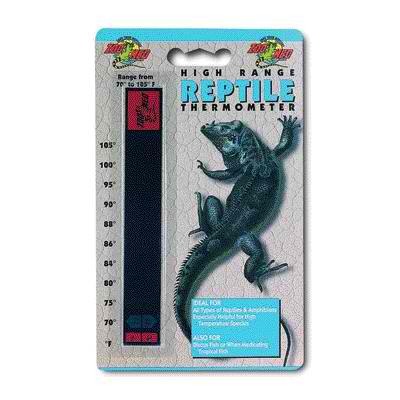 Excellent for use with Zoo Meds Ceramic Heat Emitter and the Repti Therm Under Tank Heater. Safety cover prevents accidental bumping of the temperature control dial! 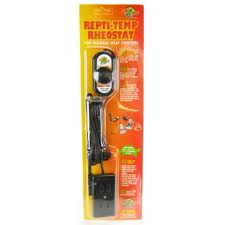 When used in conjunction with a timer, natural conditions are replicated by providing the proper photoperiod for your reptile, along with a beneficial nighttime temperature drop (consult a good book on your species to determine its specific temperature requirements). Range is from approximately 70° to 110°F (21° to 43C). 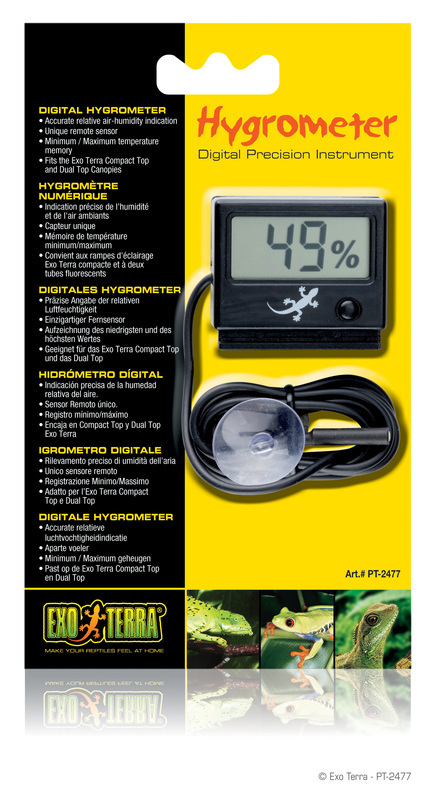 Zoo Med's Precision Analog Gauges are of professional breeder quality, with many features not found in cheap imported gauges. Features include European-made precision German movement, side-venting to prevent against "fogging" inside the thermometer, and Velcro backing enabling you to remove the gauge for terrarium cleaning and maintenance. Liquid crystal thermometer for all types of enclosures. Ranges from 70F to 105F (21C to 40C) with easy to read crystal coloring.